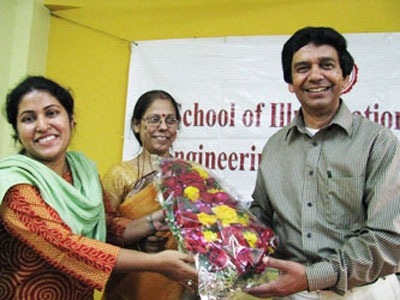 On an invitation by the School of Illumination Science, Engineering & Design, Dept. 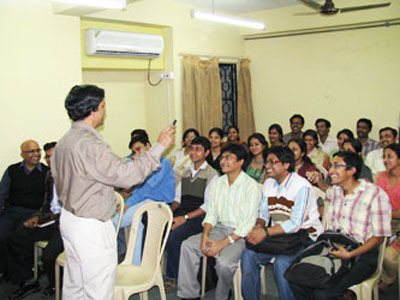 of Electrical Engineering, Jadavpur University, Manick Sorcar gave a speech on the fundamentals of Laser and opened discussions with the students regarding the Storyboarding of his forthcoming Laser show in San Francisco, CA, USA to celebrate India's Republic Day on January 26, 2010. Manick explained how the narrow but strong beam of coherent light can be programmed to race along a predetermined path to give the optical illusion of a still graphic or moving animation with the help of a slew of new lighting equipment such as the actuators, galvos, X-Y scanners, PCAOMs (Poly Chromatic Acousto Optic Modulators) etc. He explained that Laser art is not a standard computer graphic like they are seen on a monitor or TV, or an image that is projected on a screen from a slide show. Laser art is actually a line drawing sketched on the computer as a series of electronic points, which a single beam of laser follows to connect the dots to give the optical illusion of a complete image on the screen. In reality the single beam is stationary. With the help of the computer, two tiny mirrors are programmed to move the reflection of the beam very fast - one on X-axis and the other on Y-axis, precisely following the point-path of the drawn image. For a flat drawing it is projected on a screen; for mid-air 3-D patterns it is aimed in space above the audience. He explained how a still image is drawn with Laser filtering all unwanted lines, and how a series of images must be drawn by hand or computer to create an animated movement based on the traditional principles of animation. In order to explain the Storyboarding, which is an essential part of a Laser show, he opened up discussions about his forthcoming show in San Francisco, USA to celebrate India's Republic Day. Through a QA session, the students participated with great enthusiasm offering various ideas to enhance the Storyboard, which Manick found very useful. Dr. Saswati Mazumdar, professor of Illumination Engineering and the Director of the School of Illumination Science, Engineering & Design, invited Manick to tour the Illumination Engineering Laboratory as well as the workshop where the students have hands-on experience with the technologies of the state-of-the-art in lighting such as the LEDs, CFLs, and low-pressure sodium sources. It was a heart-warming experience for Manick to tour the lab, workshop, meeting with the students who are the future of lighting, and the wonderful teachers of Illumination Engineering, some of them are graduates from this university. Manick is humbled by the fact lighting design books written by him are used as a text at this great university.